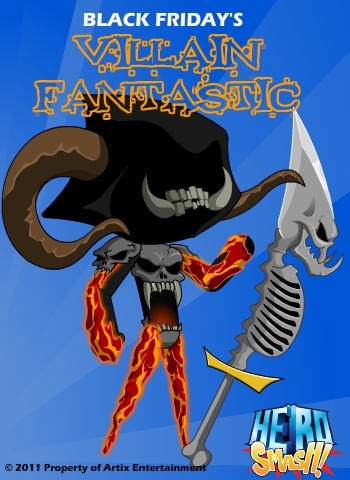 Black Friday Items: Villain Fantastic! It's Black Friday, and while some stores are offering crazy deals on just ok stuff, I figured I would offer a once in a life time oppourtunity to buy a really cool set. I decided to run with the "black" them of the day and make a villain centric set. I give you Villain Fantastic! This is one scary set. I think there are enough skulls in this set, but I'm pretty sure Artix would want some more... and on fire. Now for the fun part. In honor of this being a special day these SmashCoin items have been tagged SUPER MEGA ULTRA RARE! How often does that happen?! Actually I dont really know, but I would think it's not that often. You may be wondering if these items are faction specific? In the end I thought long and hard on it (about 2 minutes or so). And I came to the conclusion that everyone should get them, if they want. There could be some heroes that use fear to intimidate their enemies, and a skull faced armor is just what they need. The three items can be found in the SmashGiving shop! Have fun with it!